CHICAGO – Paul Schrader can absolutely claim the title of Cinema Icon with his 40 plus years of influence and involvement as writer or director in memorable films such as “Taxi Driver,” “American Gigolo,” “Raging Bull” and “Auto Focus.” His latest written-and-directed-by film is “First Reformed,” featuring Ethan Hawke. CHICAGO – In the latest HollywoodChicago.com Hookup: Film, we have 40 pairs of advance-screening movie passes up for grabs to the new comedy “Why Him?” starring James Franco and Bryan Cranston! ‘Barbershop: The Next Cut’ Red Carpet, March 14th, 2016. CHICAGO – The Chicago premiere of “Barbershop: The Next Cut” took place in March of 2016, and what made it special is that the principle cast walked the Red Carpet and did a “tour” of the city to promote the film. HollywoodChicago.com photographer Jeff Doles was at that Chicago Red Carpet, which took place at the Showplace ICON Theatres, and captured these Exclusive Portraits. 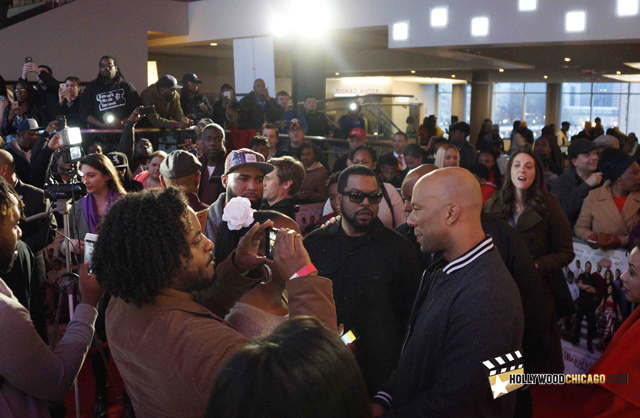 CHICAGO – HollywoodChicago.com brings you our red-carpet interviews with the stars of “Barbershop: The Next Cut”! We speak with Ice Cube, Common, Cedric the Entertainer, Anthony Anderson, Deon Cole and Regina Hall at the Chicago premiere on March 14, 2016. CHICAGO – Marlon Wayans will do practically anything for a laugh, and that is to the audience’s advantage in the sequel to last year’s smash comedy, “A Haunted House 2.” Joining him for the second go around is hot comic Gabriel “Fluffy” Iglesias and the reliable Affion Crockett, who is reprising his role as Cousin Ray Ray. CHICAGO – In the latest HollywoodChicago.com Hookup: Combo Pack with our unique social giveaway technology, we have 10 free Blu-ray and DVD combo packs up for grabs for the home entertainment release of the new Marlon Wayans spoof “A Haunted House”!